DeWALT is a renowned American company which is known for manufacturing good quality power and hand tools, tool accessories and outdoor equipment. The DeWALT DWE 402 is one of their prominent tools that has managed to achieve customer satisfaction with its performance. It is one of the best angle grinders in the market. It is an angle grinder that is powered electrically through a cord and contains an 11amp motor. With this motor, the grinder is able to provide you with an 11,000 RPM wheel spinning and also a stable performance. The DeWALT DWE402 angle grinder is a standard equipment in metal fabrication shops where metal is built through cutting, bending and assembling processes, on construction sites, machine shops as well as for emergency rescues. When choosing an angle grinder, you should consider the disc size and the motor power. These factors will ensure that you get the best workplace comfort and performance satisfaction. 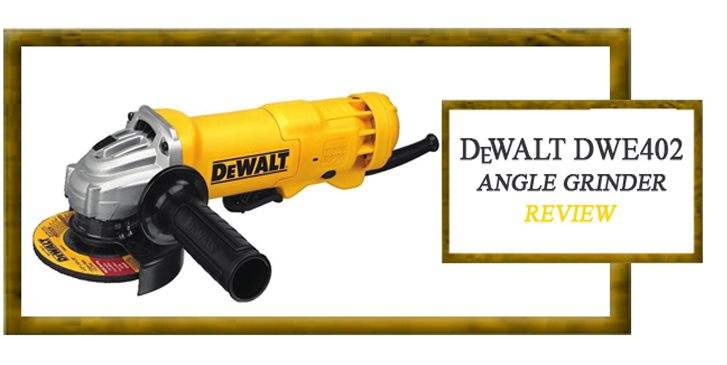 The DeWALT grinder uses a 4.5 inch wheel with an 11amp motor giving it high performance. The DeWALT DWE402 4.5 inch 11amp Paddle Switch Angle Grinder features the next-gen 11amp AC/DC 11,000 RPM motor and a 6.2-pound weight, giving it the best power to weight ratio (1.8HP). Ever worried that your grinder will malfunction due to excess debris entering the tool? The DeWALT DWE402 grinder comes with an ejection system. The system increases the durability of the grinder while protecting the internal mechanism by ejecting dust and debris particles that enter the device through the air intake vents. This ensures that dust will not interfere with the performance of your grinder. Additionally, the ejecting system helps you maintain a tidy working space. The one-touch guard in the DeWALT DWE402 allows you to rotate the grinder 360 degrees in one simple movement giving it incredible flexibility. It also means that positioning the grinder is really easy and eliminates the need for the DeWALT grinder to adjust the guard location. Ever used a grinder whose wheel change process needed a whole lot of tools? Gone are those days as the DeWALT DWE402 grinder includes a quick change wheel that allows performance of this task on the fly. It allows wheel change without necessarily using a wrench or any other tools. This is a lock-off system in the DeWALT DWE402 angle grinder that is equipped with a safety lock system that prevents any accidental startup. When the tool is on, the lock-up won’t allow the grinder to start accidentally. This contributes to the safety of both you and the grinder as accidental startups could cause damages to your workspace or serious injuries to you as the handler. This is another feature of the DeWALT DWE402 that puts it in the limelight ahead of other grinders in the same class. The oversized brushes are twice the size of ordinary brushes used in grinders. Their size ensures that they will last twice as long as those in other competing models. This increases the durability of the grinder and gives you better performance. The bevel gear is a gear where the axes of the two shafts intersect and the tooth-bearing faces of the gear are conically shaped. In the DeWALT DWE402 angle grinder, the bevel gear ensures long transmission life. This means that you can use the grinder for a long time. This also increases the durability of the grinder to maintain the smooth performance it offers. #.It is highly flexible, making it perfect for both intricate/delicate work and for work that needs more effort. #.The grinder has an extended lifespan that makes it last longer than the competitors. The oversized brushes plus the large spiral bevel gear help extend the grinder’s life. #.For people who use grinders on a daily basis, the comfortability of the grinder when holding and using it is really important. The DeWALT DWE402 offers a small gripping surface, yet is big enough for you to hold without the fear of dropping it making it highly suitable for extended projects. #.The eye-catching design. The DeWALT DWE402 grinder is made of top-quality metal and plastic materials with blending colors that match everything you are looking for in your tools. #.The grinder has the ability to maintain a clean working space around you and inside the air vents as it has the dust ejection system. #.The DeWALT DWE402 also offers you value for your money. This grinder is available at an affordable price while offering you an extraordinary performance. #.The DeWALT DWE402 is possibly quite uncomfortable for some who find it slightly bulky. The grinder features a weight of 6.2 pounds, which can be heavy for some. #.The DeWALT DWE402 angle grinder is more suitable for more experienced users. Although not necessarily a con, this model is better suited for more experienced users. #.The DeWALT DWE402 kit does not include grinding disks. You will need to purchase these separately, which is an added expense. Q. Is the grinder ac/dc? A.Not necessarily. It’s a really strong tool. A.Yes, there is an option to purchase it with a kit box. The DeWALT DWE402 is with no doubt one of the best angle grinders in the market, especially for those using it on an everyday basis and require a reliable tool. This tool offers a great variety of features at a relatively low price. Moreover, it features a 4.8/5 rating from 400 reviews on Amazon. This is definitely the tool for anyone looking for an angle grinder with a combination of strength, perfection and comfort. Other than using a cutting disc, is anything else required to use this as a metal cutting tool? Thanks for asking! For cutting metal you need these tools Working gloves, ear protection, and goggles. You’ll also need a blade for your angle grinder.